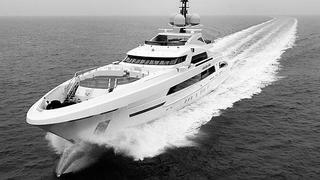 Heesen Yachts announces successful sea trials for its new flagship Galactica Star, launched at the end of March. Galactica Star has completed extensive sea trials in the North Sea where strong weather conditions didn't affect performance of the yacht. Indeed, she exceeded her contractual top speed (27 knots) reaching 28.8 knots at half load. Galactica Star is a 65-metre all-aluminium motor yacht based on the Fast Displacement Hull Form (FDHF) developed by Dutch naval architects Van Oossanen & Associates. Powered by twin 4,300kW MTU 20V 4000 M93L engines, this truly innovative hull design increases the overall performance of the yacht by around 30 per cent. Galactica Star has an exterior design by Omega Architects and an interior by Bannenberg & Rowell accommodating 12 guests in a full-beam master on the main deck, a VIP on the upper deck and four double cabins on the lower deck. Special features include an aft duplex beach club comprising a 10 sqm side balcony, a 22 sqm swim platform, bar, sauna, hammam, lit with natural light coming through the glass bottom of the main-deck swimming-pool. Galactica Star will be delivered at the end of June.